Me and my friend James took the short trip up to Winston-Salem to see a game auction. 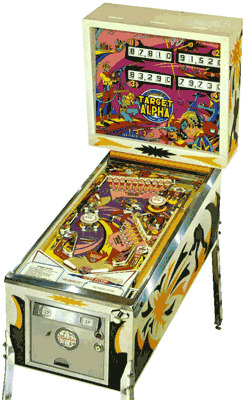 Our favorite pinball was, by far, the Fireball Classic. (You can see it on the right side of the first picture) We were racking up tons of free games on it until our mojo ran out. Luckily, I remembered to bring an extension cord. That way we could power up any game there. Unfortunately, we forgot to bring quarters!!! Not that we really needed them, but without them, we had to find and manually close the coin switch for each game. No problem really, but we got a good laugh out of it. Pinball Auction, a set on Flickr. 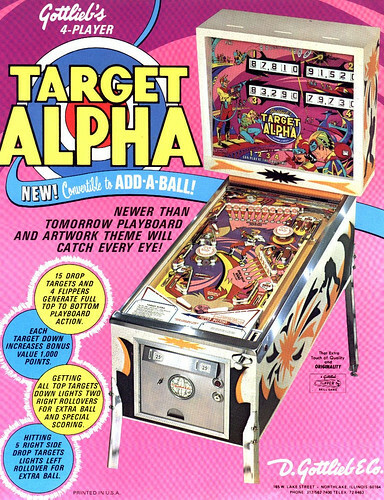 This is the original Target Alpha flyer from around 1976. Target Alpha Flyer, a photo by Particle Man on Flickr. This is my first pinball machine. I wanted an electro-mechanical machine from the mid 70’s and this one fit the bill perfectly. There is just something special about EM machines… simplicity, great look, mechanical sounds, real chimes, etc. Manufacture by: D. Gottlieb & Co.
I’ll be posting more information later including pictures and small repairs I’ve done.